To accomplish steps 1, 2 and 4 above you will need to consult Google’s Documentation. After finishing steps 1 and 2, you will need to send Paytronix a Google Cloud Messaging API key and app package name. You will need to create and send two keys: one for the development environment and one for the production environment, once your app is certified. Please contact Paytronix for a list of IP addresses to add to the IP whitelist for each key. Unlike the iOS ecosystem, you must implement step 4 yourself - the Android operating system will simply hand the push message off to your app. 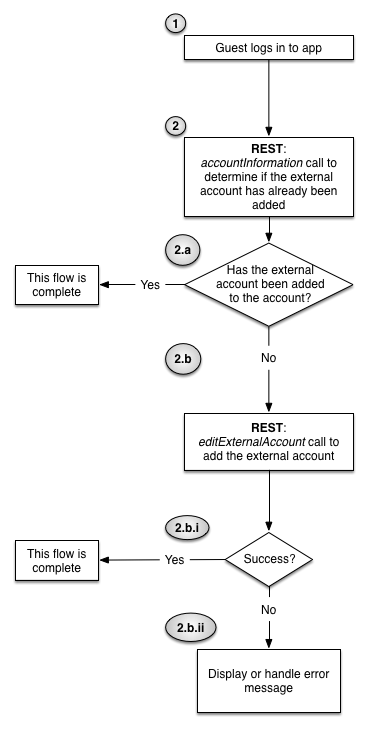 If the external account hasn’t been set, then send an editExternalAccount call to Paytronix with the external account formatted according to this specification: Format of External Account Object. The Paytronix server will return either a failure or success message. ii. If the server response is a failure, then it is up to the merchant on how to handle the situation. We suggest that the integration uses the error code and error message returned by the system to determine the next action. This is the registration id provided by the GCM service. This is the client_id you were provided when you registered your integration with Paytronix. It should be specific to your Android application; if you implement both an iOS and Android application they should have different integration identifiers. This is information about the device on which the app is running. This should include information on the phone model as well as the version of Android it runs. This should be a unique identifier to the Android app. If there is an equivalent iOS app these identifiers need to be different. We recommend using the package name of your app. This is an example for guests logging into the app. 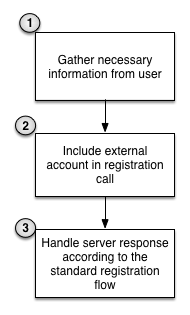 See Google’s Documentation for full documentation on Google’s push messaging service.